All welded construction is ideal for all heavy duty assembly or maintenance applications. Legs are 3"x3"x3/16" thick with pre punched floor mounting holes. 12 gauge lower shelf is 27-1/2"D with 5"H backstop for ample storage. 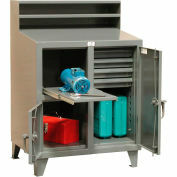 34"H. Optional locking drawer is 16"Wx20"Dx5"H. Durable gray powder coat finish.